In October, after a 24-year suspension, the Queen of Jaffna resumed its regular service along the 250-mile route linking Colombo, Sri Lanka’s Sinhalese-dominated capital, and the Tamil north of the country. 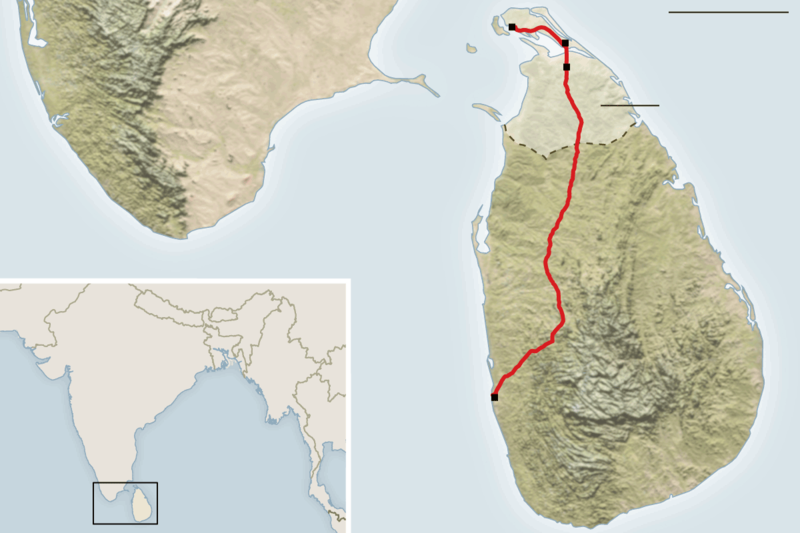 The train was blanketed in flowers and banana trees as it pulled out of Colombo Fort, celebrated as a sign that the bloody wedge between the country’s two largest ethnic groups was now gone. 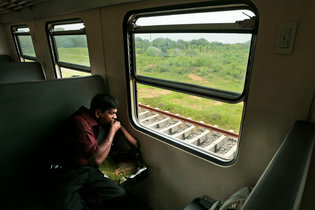 But conversations on board the train made it clear that a psychological gulf still separates Sri Lanka’s northerners from its southerners. Visitors from the south, in many cases, are full of sincere pride about what the government has brought to the north — peace, they say, and economic development. For many Tamils in the north, though, the relief of peacetime is mixed with darker feelings of defeat and humiliation. And the restoration of train service does not ensure that these groups are speaking to each other. Twenty-six years of civil war physically devoured this train, known in Tamil as the Yal Devi. Tamil rebels pulled up steel rails and wooden ties to build bunkers, and the Sri Lankan Air Force blew the roof off Jaffna’s train station. But even before that, people riding this train knew they could be attacked by militants from either side. If a bus was ambushed, the driver could brake and throw the vehicle in reverse. A train loaded with people had nowhere to go. Mr. Kadirgamar recalled waiting at the station in Colombo one afternoon in 1977 — his wife and two sons were expected from Jaffna on the afternoon train. It was not unusual for Yal Devi to be late, but this time, when he asked about the delay, the station officers were silent. He found a telephone and called two cousins in the police force. They also refused to talk. Rushing outside, he picked up an evening paper, which reported that rioting had broken out in Jaffna. Five years into the peace, a ride on the Yal Devi is stunningly normal. Passengers line up at dawn with pillows and sleeping children, and there is the slapping sound of people in sandals running to catch the train. The landscape of Colombo’s postwar boom flies by, including one of Mr. Rajapaksa’s pet projects — the Chinese-financed “Lotus Tower,” which, at its final height of 1,150 feet, will be South Asia’s tallest structure. After that come slums, a mud-colored river and abandoned rail cars, their metal sides so corroded that sunlight shines through in patches. After that signs of human life are swallowed by the jungle. “There are no words, that much I am happy,” said Mr. Kavinda, whose T-shirt read #SELFIE, as the train moved toward the north, a territory long closed to him. As a southerner he grew up far from the front line of the civil war, but the fear of terrorist bombings was present from his earliest memory, when his parents nervously whisked him away from school the minute class was dismissed. Visiting Jaffna was a way of proving that the fear was gone forever. Sinhalese vacationers sprawl out in the course of the journey, beating drums and singing bayila, the folk songs left behind by Portuguese settlers. The train, restored with the help of an $800 million line of credit from India, has made the journey a comfortable and safe one, just six hours on the fastest train. Government employees receive free passes for reserved seats, and many stay in hotels operated by the army, making a circuit of Buddhist temples and notable civil war sites before returning home. The Tamil passengers are not singing. They are edgy, perhaps because the train is packed with government soldiers, returning to their posts after home leave. Officials have said that the number of government troops in the northern province has been steeply reduced, offering estimates as low as 12,000, but C. V. Vigneswaran, the province’s chief minister, said he believed that the true number was far higher, closer to 100,000. After years of counterinsurgency, many Tamils are wary of questions from strangers, lest they turn out to be informants. The last miles of battleground stretch out beyond Kilinochchi. Single bullet-pocked walls stand alone, fingers of steel reinforcing bars twisting into the air. By the time the train pulls into Jaffna, which was in government hands at the end of the war, a kind of normalcy has returned to the landscape — fruit trees, verandas — and passengers stream off into a city adjusting, awkwardly, to postwar tourism. Siva Padmanathan, 44, who offers auto-rickshaw rides from the station, said his conversations with southern customers were strange ones, even when they managed to find a common language. But little of that came across to Mr. Kavinda, the Sinhalese passenger, who returned south again on the Yal Devi, thoroughly elated by his tour of the north. He said he wished that the Tamils he met had spoken better Sinhala, since, as he said, “Sri Lanka is a Sinhalese country.” But he was sure they were glad to see him.